I hung these puffy ones along the porch. And had a few more daisy-style inside. I like the second style much better. The difference is the balloon size. The puffy style uses all 12" and the daisy style uses 7". I didn't realize I'd purchased a different size until I started blowing them up. And I could only find packages of all pink balloons at the two stores I went to in the 12" size. If I had more time I might have searched out the 7". 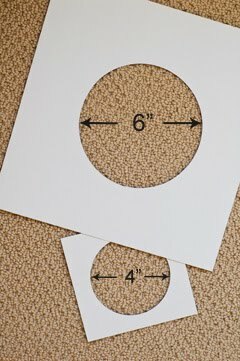 Step 1: Cut two circle templates from chipboard, one approximately 6" across and the other 4" across. Step 3: Tie one set of two balloon petals together. Step 4: Tie another set of three balloon petals together. Step 5: Tie the two balloon centers together. Step 7: Wrap the balloon centers around the five balloon petals once, so there's one on each side. I used fishing line to hang the flowers. 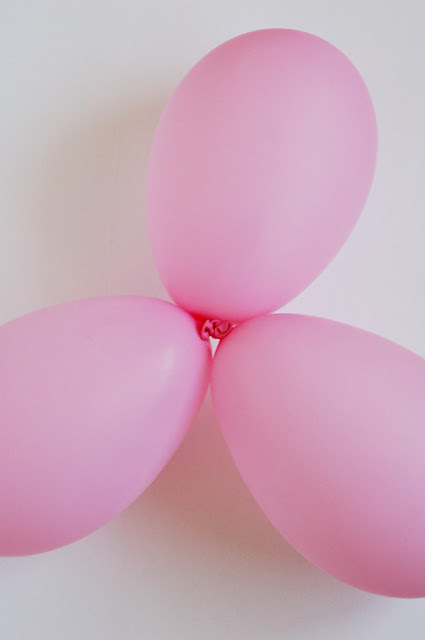 I found the balloons lose their shine after a couple of days, so it's best to make them the day before or day of the party or occasion. Be sure to send me a photo if you end up making them. Those are so delightful! I might have to make some for Emma's birthday. She wants to have a "peace" party -- whatever that is! Peace out. She must mean a hippie party. How fun! Let me know if you want to use my templates. Yes, thankfully, she's changed her mind and is having a Girl Pirate Party. So, I don't think darling pink balloon flowers will be in order. Arrrgh! featured this awesome craft on my blog today! I saw you over at A Girl and a Glue Gun. These are so cute. Thank you for sharing! i am sooo excited i found this tutorial on Pinterest! 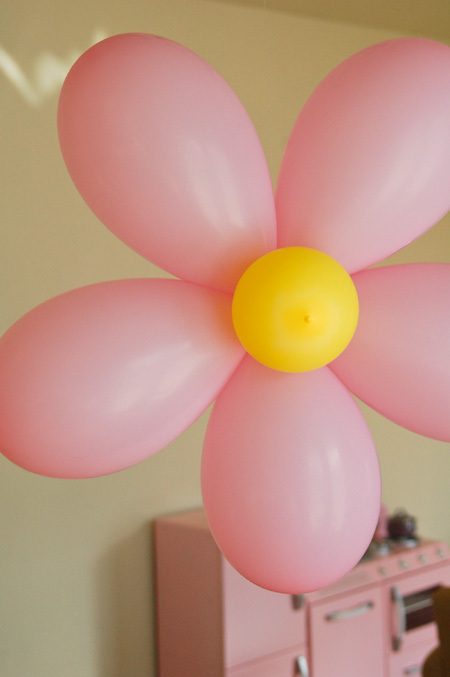 My daughter's 2nd birthday is this weekend, and I am all over making these flower balloons!!! Thanks for the inspiration!!! I made these for my daughters 1st birthday party!! I could only find 12" balloons so they had a little more of the point on them I think the 7" ones would look better. They worked great for outdoor deco!! Thanks for the idea!! So glad they worked for you, Sarah. And Happy 1st Birthday to your little one! Going to have to try this for my daughter's birthday. So cute, thanks for sharing! Im trying to make these for my daughters first birtday party. We are putting ours on dowel rods and putting leaves and things on them. using 12" balloons. but the problem we are having is that when we put the five balloons together one of the fifth balloons wants to push to the center front. Its really annoying because they look so much better with the five petals! What am I doing wrong>>? 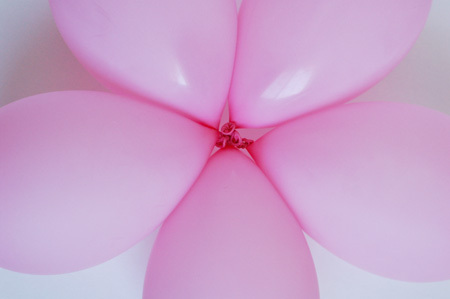 The petals should lay together when you put the smaller balloons in the center. Hope that helps. My 16 year old grandaughter is having a pinkalicious party and these will be perfect!! Thank you! Have fun and happy birthday to your granddaughter. I used 12 inch balloons and made them 6 and 8 inches to get away from the unsightly ends. It worked great. The balloon flowers are hanging up now and our guests will be here for my daughters 3 rd birthday party in a few hours. Thanks for the tutorial. Did you tie the balloons together with string or just twist the ends together? Sara, I just tied the balloons together, no string. I love the idea of using them for a baby shower--darling! So glad they worked so well for you. I am so completely confused as to how you tied them together. I see that you answered someone's question saying that you tied the balloons themselves..no strings. I can't for the life of me seem to be able to do that. Could you explain further please??? Glad to see the above question... I'm not the only one who can't figure out how you tied the balloons together. I am anxious to see your response-- baby shower is coming up soon!!! I responded to Norma via e-mail, but thought I'd respond here incase others have the same question. 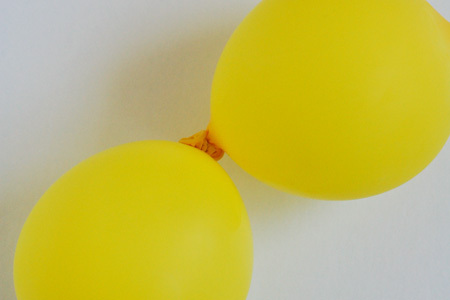 After you've inflated the balloons and tied them off, there's that little excess piece of latex hanging from the knot. That's what you use to tie them together. 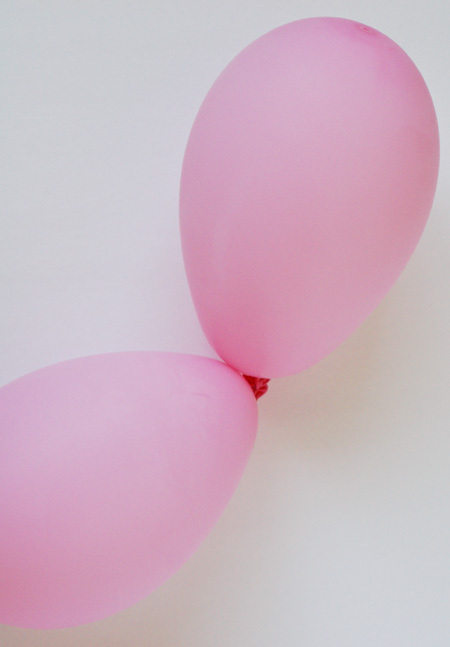 Make sure you're not over-inflating your balloons or there won't be enough excess after the knot. Does that make sense? If you're making a lot, get some help, it can be a bit hard on the fingers. I feel like this would be awesome for any little girls birthday! All the guests would love them and you would be Supermom to your daughter. If you want more help planning your child's birthday party another great site is www.funtiqueparties.com. 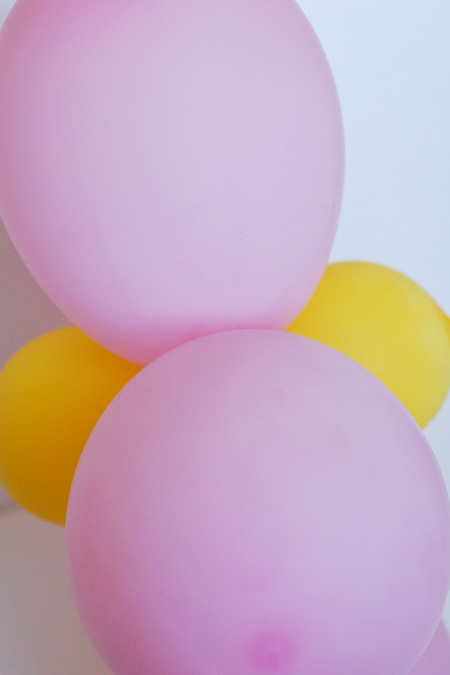 Did you use helium to blow up the balloons or just blowed them up? Hi there, I am also using them to decorate a shower party for a baby girl. They will look cute on the outside wall of the party hall. Thank you for posting the instructions. Very clever. I like how you have the centre on both sides of the flower so when it spins in the wind it won't matter. I love these! If you are using air vs helium and want to attach the to dowels to stand up in flower pots - how do you attach the balloon flower to the dowel and keep it in the perfect position and not fall off? You can also us an air compress with the special attachment to blow the balloons up. It's a lot easier!! I'm also having trouble with tying the balloons together .... I tried with ribbon, but the balloons won't lie flat. hen tie them together with what remains of the balloon 'neck'? Beautiful! Where did you find the few 7" balloons that you got? I have even googled it and can't find that size online. Doing this for my daughter's flower themed 4th birthday party! I vote you make a youtube video of the process... I think it would help me and a few others wondering about the specifics of tying the balloons :). Either way, THANK YOU for the idea! I hope I can figure it out when the time comes in a few weeks! Hi! I'm in love with this idea. 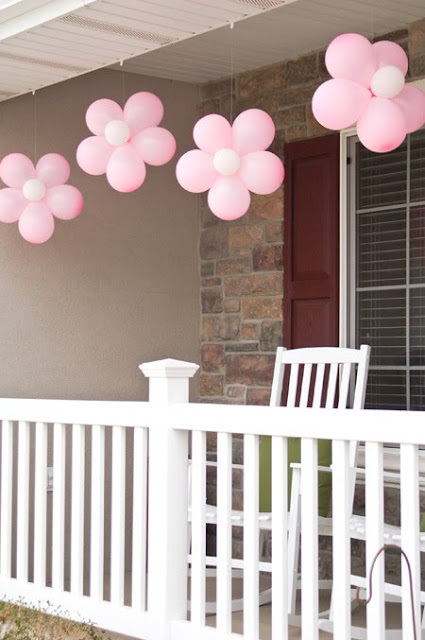 What size are the daisy balloons and also what size are the smaller ones in the middle? I'm making them for my daughter's party on the 7th! OMG, such a genius idea! I made them for my daughter's 4th bday party. They turned out awesome. And it was really easy after a couple tries. Thanks so very much for sharing.